We love Carbs and we love potatoes the most!! mmmm maybe joint most with bread and pasta but its up there haha! Honey isn't a big jacket potato fan but she does love a chip! and these are the best of both worlds! Either peel the potatoes or leave the peel on and scrub well. 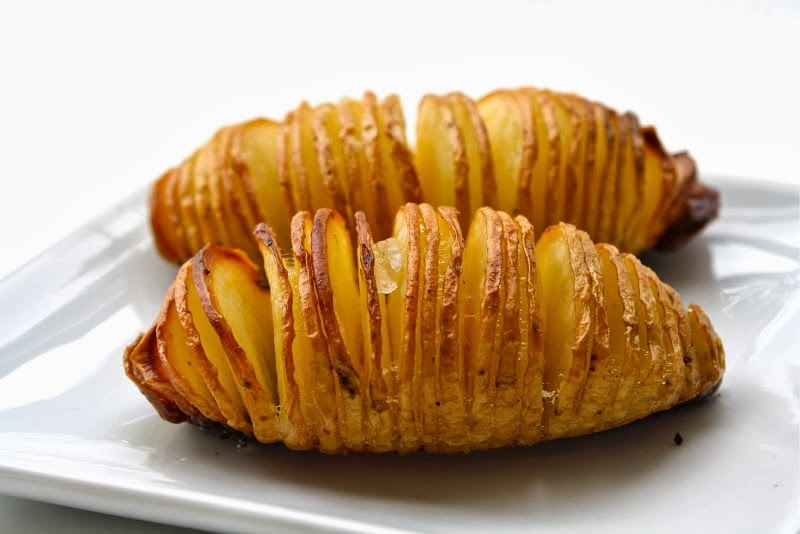 Make small slices ¾ of the way through each potato, all along it (if the potato is placed in a large spoon the edges of the spoon will prevent you from slicing clear through the potato). Place potatoes in a greased baking dish. Brush surface of the potato with melted butter, sprinkle with salt and pepper. Remove from the oven and sprinkle with parmesan cheese and breadcrumbs. Return to the oven and continue baking for 15 minutes or until potatoes are tender and crust is slightly browned. Serve immediately. Room on The Broom Live! Its all about the wrapping! No White after Labour day!